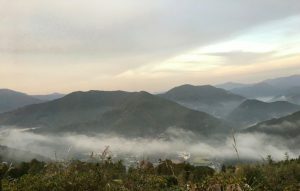 My hiking pilgrimage followed the Nakahechi Route from Takijiri (on the western side of Japan’s Kii Peninsula) through the mountains to Kii-Katsuura, on the eastern coast. Along the way, I visited the three Kumano Grand Shrines: Kumano Hongu, Kumano Nachi, and Kumano Hayatama. I stayed in minshuku (traditional family-run inns similar to a bed and breakfast) and ryokan (traditional inns), and met a number of wonderful, interesting people on the trail–fellow travelers from all over the world, some of whom became friends I hope to stay in touch with far beyond this journey. Apparently, the toilets in Yokohama are a “no concert” zone. I’d wanted to hike the Kumano Kodo since learning about the history of the route during my college years – more than two decades ago. I’m pleased to say, the experience exceeded my twenty years of accumulated expectations. Mentally, I’ll be unpacking the experience for a long time to come – even longer than it’s going to take to edit the thousands of photos I took on the trail. For now, I’m looking forward to a good night’s sleep – without the need to get up at 5:30am to get back on the trail!